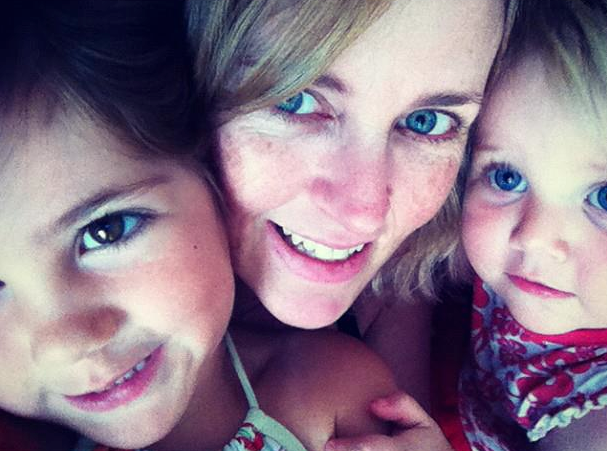 Alli Price has got her business name down pat…she really is a Motivating Mum. Though I’ve only had the pleasure of talking to her once or twice on the phone before, and have had a lot less time that I would like available to engage with the Motivating Mum Facebook page and website, through what I have seen, I have found Alli an inspiration and look forward to getting to know her better. A certified professional life coach (ahhh now I understand the great inspiration! ), she’s based in Melbourne, pictured here with her cute girls Amelie, 5 and Freya, 1 (nearly 2) and has run her business for 5 years. I was sitting at home one day on my own, looking after bub and trying to run my coaching business. It was so lonely and a little depressing so I decided to start the Businessmums’ Networking Lunches – in an attempt to get out and get some intelligent conversation and also expand my network. It turned out there were a lot of mums at home feeling just as I was! Never out of bed before ten, worked as a waitress, living in London and travelled the world at will, stayed out late and saw loads of friends! Still try to stay in bed as late as possible but am losing that battle, still up late (usually 12am) but it’s because I’m typing like a maniac. Have never worked so hard and so constantly in my life. Furthest I get from home are the playgrounds but am finding my fulfillment in my beautiful girls (well, most of the time) and running a business where I get to feel amazing every day as I’m helping people. Do you find your previous qualifications relevant to your life now? I find the qualifications so relevant as my coaching course taught me so many amazing coping techniques, taught me how to listen and ask great questions and also challenged me to work out what was most important to me. How natural I would be at it. I was never maternal and had no experience with young kids (aside from a little babysitting) so I was quite happy at how well I eased in to it. Did anything surprise you about starting a business? Just how much I would love it – there is nothing else I would rather be doing in the world! What are your greatest wishes for your children and your business? My greatest wish for my children is that they follow their hearts and lead adventurous and fantastical lives. My greatest wish for my business is that it continues to grow (possibly to other countries in addition to Oz and the UK) so that I can continue helping mums everywhere. Selling out my Mummy Mentoring Festival (where high profile women in business donate phone mentoring sessions for regular mums to buy) in 4 hours and making $1 200 for a new charity, Support for Mums. A challenge you are tackling? Slowing down. I am very spontaneous and if I have what I feel is a great idea, I will have it implemented in days. I have been trying to slow down and schedule implementation of these ideas to ensure I don’t burn out! Starting a business is not a quick fix if you need to make money quickly, it can take a long time to start earning. Read as much as you can – blogs, newsletters, articles – try and learn one thing a day. Before starting in social media, Google the etiquette of how to interact. What is one of your favourite resources? I love the workbook The Artists Way – it is amazing if you’re trying to work out what you want to do with life, encouraging your creativity and also for just stopping and appreciating life while it speeds by. What type of work does your partner do? He’s a kids soccer coach. My boyfriend is fabulously supportive and very interested in what I do. Even my 5 year old daughter talks about what I do and answers the phone for me. Can you share a favourite Professional Parents business? Picking a business is like picking a fave child – can’t be done! I have a desk nestled in a huge window in the lounge room which makes it lovely, light and bright. I am looking forward to the day I can have all my things on my desk and a plant but my 2 year old jut pulls everything down so it’s pretty sparse. Working from the minute I get up to the minute I go to bed: breakfast, oldest to school, depending on the day a mix of housework, lunch, sending emails, looking after bubs, school pick up, dinner, bath, bed, back to the computer while watching TV and then bed about 12am! I love being able to be home for my kids, take them to activities, hear their stories. I also love the opportunity to build something that is mine, to be creative, to continually learn. I also love being able to build something that helps people who need it, as opposed to working and making money for a big company that already has more than enough money. A myth about mums in business that constantly annoys me is that we’re all home making bibs. People constantly underestimate the experience, skill, intelligence, creativity and passion that mums in biz possess. Do your children go to school/daycare/childminding? My 5 year old is in preps (am still getting used to the new routine) and my 2 year old is in Nursery 2 days a week – yays! Thank so much for your time Alli. Make sure you check out the wonderful Motivating Mum website and Motivating Mum Facebook page. Recently I had the pleasure of meeting Carly Tribe who is working alongside Alli to provide Motivating Mum Brisbane events. Wendy Tadokoro – Organising Works!